Over the past few years, we have been descending some bigger canyons. By this I mean the pitch is longer than half the length of your rope, e.g., 30m for a 60m rope. On these big pitches, it can be difficult for deploying your rope due to obstructions or weather conditions. Thread and pull enough rope through the anchor for the pitch. 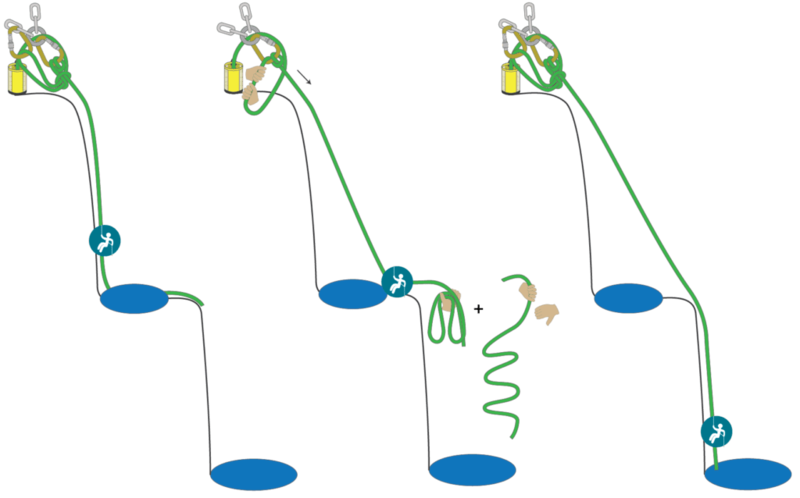 Throw the rope to get close to the bottom and set up a releasable system. Join and stack the remaining rope on top of the second rope/bag. Once the first abseiler can see the bottom, they ask for more rope to be lowered to set the length. See the post Rig a Big Canyon Pitch for more information. This technique works fine if you have a simple straight drop, but what if the canyon goes around a corner, has some other obstructions (e.g., trees, a large pool, a big rollover, etc.) or it’s windy, and you can’t throw the rope all the way? This approach is ideal for an unfamiliar canyon or first descent. Thread and throw for the first part of the pitch you can see. When the first canyoner gets to the obstruction, they ask for more rope to be lowered. As the rope is lowered, the canyoner pulls in through their abseil device (so they stay in the same place). Note: the canyoner needs to be on a ledge of some description to take their weight. Once the first canyoner has pulled enough rope through to get to the bottom, they rethrow for the second part of the pitch. Ideal for a familiar canyon where you know the length of the pitch (e.g., 45m). This method works backward out of the bag and keeps things tidy and manageable for the first canyoner. As you only thread a small amount of rope through the anchor, this technique is fast and efficient. Thread 15m of rope through the anchor leaving 45m in the first bag. Join/stack this 15m of rope on top of the second rope/bag. The first canyoner abseils with the first bag until they reach the obstacle and to where they have a clean view/throw to the bottom. The first canyoner feeds the rope out of the top of the top of the bag forming a loop. They untie the end of the rope from the bag and throw, checking that it reaches the bottom. These are a couple of ideas to put into your toolkit. As always it is crucial you assess each situation on its own merits and come up with a suitable plan. 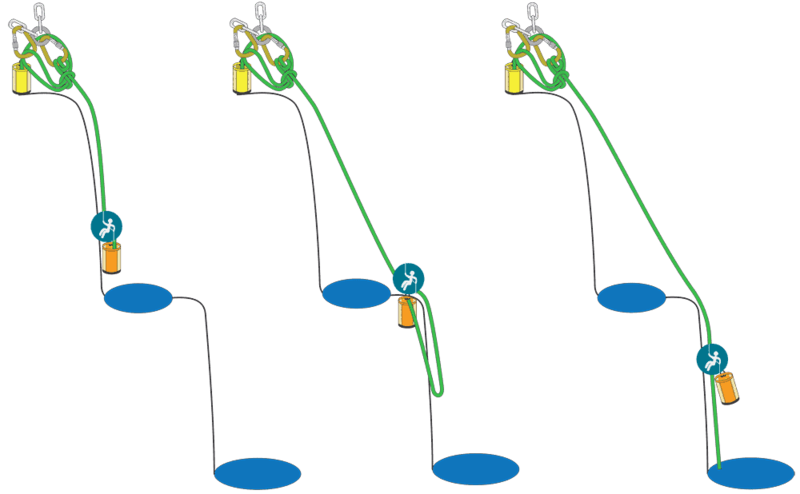 We use single rope aquatic canyoning rigging techniques where you set the length of the rope. This post is not a full description of all the techniques. 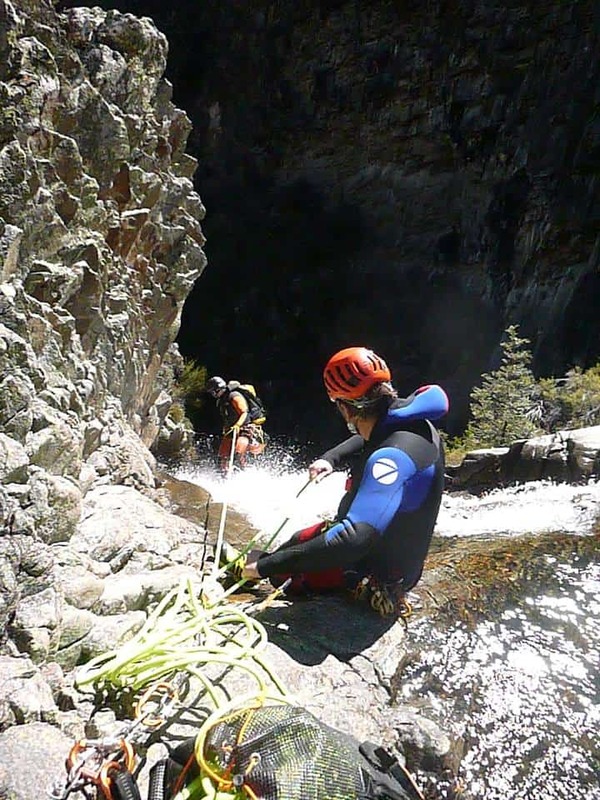 Check out the Canyoning Technical Manual.